The following paragraphs were cut from Faith and Flame. Originally I intended to develop the Drac as a whole Mystery Cult style apotheosis but felt that there was more story potential for a Tribunal Book in making the dragon scion a shadowy antagonist rather than just producing another Mystery Cult that may or may not be of interest to players. Likewise, dropping the other heir, the apprentice of Jean of Mondragon, left room for players to involve their characters in the Drac legend directly but at the cost of losing the Mythic Blood description as I’d already detailed the Balthazarine bloodline. At the Troupe’s discretion, one of the magi may have been born along the Rhone and may choose to belong to the lineage of the Elder Drac. As the magus reaches maturity and begins the search for an apprentice, he is afflicted by disturbing visions that force him to seek out the source of his dreams, coming into conflict with his “siblings” over their draconic inheritance. Your character descends from the legendary Elder Drac of Beaucaire and is heir to a Mystery Script of ultimate draconic transformation. You gain all the usual benefits to spellcasting granted by Mythic Blood (see ArM5, p47) and may choose a Minor Magical Focus in a subset of Mentem magic, usually changing memories or erasing memories. Additionally, your character can turn invisible as per the Hermetic spell Veil of Invisibility with Personal range (ArM5, p146) without requiring either words or gestures. Unlike the equivalent Hermetic spell however, the character does not cast a shadow. Finally, your character gains (at no extra cost) a Minor Personality Flaw, either Avaricious or Cruel, reflecting the greed or inhumanity of his draconic heritage. Upon reaching maturity as a magus within the Order (achieving the rank of master, successfully opening a talisman or deciding to seek out an apprentice), you become afflicted by the Obessed Flaw and are plagued by visions of watery death and shifting teeth as the inheritance of your draconic blood calls you home to your ancestor’s lair to contest with the other scions of the Drac. To offset this new Flaw, you may choose to develop either the Self Confident, Piercing Gaze or Keen Vision Virtue. The truth of the Drac legend runs even deeper still – Aucassin is merely the latest in a line of descendants of the ancient Drac that are regularly drawn to the lair every century to replay the cycle of rebirth. Each generation, the descendants of the Drac find themselves irresistibly drawn to the old well of Beaucaire as they reach maturity and power, abandoning their previous goals in search of finding a worthy apprentice from along the Rhone. The heirs typically uncover their ancestor’s lair during their quest and soon become consumed with an obsession to ascend to dragonhood, thus perpetuating the legend of immortality. The last successful heir to the Drac died during the Schism War, and although it is not common knowledge to the rest of the Order, there have been several Hermetic claimants to the dragon’s legacy from various Houses in the last two centuries. Aucassin may become the first to succeed in living memory if he is not uncovered or challenged first but unbeknownst to the shadowy mage, he is not the only living magus aside from his apprentice with the blood of the Drac in his veins – each generation, the draconic legacy manifests in several Gifted children along the lower Rhone. Indeed, his adopted son has a draconic “brother” – the apprentice of the Arles-based magus, Jean of Mondragon, a somewhat cruel Jerbiton illusionist born into a lesser branch of the powerful Les Baux family and raised as one of the lesser nobility of Provence. Jean sadly lacks both the Gentle Gift and artistic sensibility common to many of his Housemates, possessing the Brutal Artist Minor Flaw and an avaricious nature, but is skilled at using his affluent position in mundane society to offset his perceived deficiencies. The draconic blooded child seems a good fit as his apprentice, although he is unaware of the true legacy of his heir. The following expanded description was cut, leaving the small Story Seed on page 118. The magi come to hear of Nicolette, a young woman living in Beaucaire, tells of her dreams of underwater kingdoms and dragons to all who will listen. Most folk think her mad but indulge her by listening to her stories and few place any credence to her tales. The older folk tell that she disappeared for seven years without warning, only to return as suddenly as she left, but with no memory or explanation of where she had been and no memories of her son she had abandoned as a babe. Her husband and maturing son care for her the best they can and quickly divert her talk from her dreams when strangers enquire too pointedly. The young woman was once one of Aucassin’s grogs, abducted originally to act as a wet-nurse to his sickly heir. 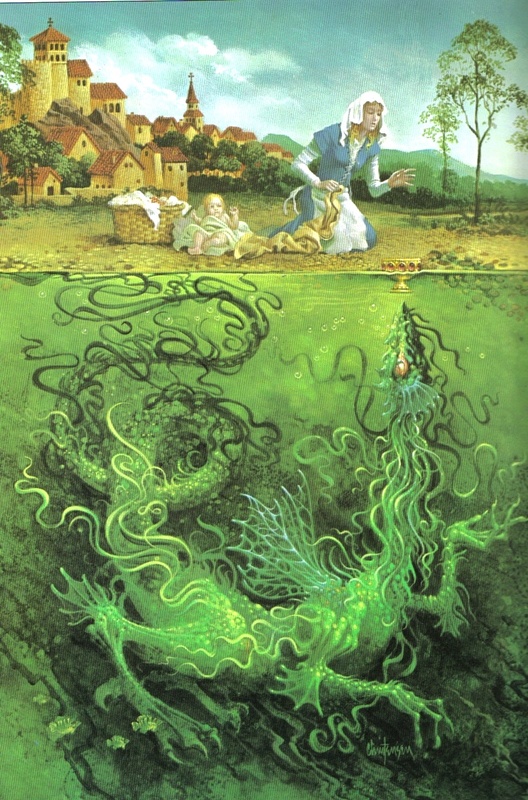 Once the child had improved in strength, he returned her to her mundane life in an uncharacteristic act of gratitude towards the family he had stolen her from perhaps driven to mimic the legend of his adopted guise but not before he took the precaution of erasing her memories of the seven years beneath the river. To cover himself further, Aucassin marked her wrist with a scar shaped tattoo enchanted with a low-level constant Mentem effect to invoke distrust and disbelief in those mundanes who hear her tale. The draconic magus has all but forgotten his former servant, but she remains a potential liability as the initial memory charm was unknowingly botched. Her years in the regio have caused significant Warping (see ArM5, pages 167-168) and she has gained the Minor Flaws Social Handicap (talking of her dreams incessantly) and Visions. Her lost experiences have begun slipping through into her dreams. Her enchanted scar has accelerated the process and she has recently gained the Minor Virtue Second Sight. Although her skill is meagre and the power of the Dominion strong within the town, it is possible she may inadvertently recognise her former abductor as he travels the town in disguise or using his invisibility power. As Aucassin has become more confident and complacent about his control over the townsfolk, he has become less careful, and sometimes roams the streets or marketplace without erecting his Parma Magica. It may be during one such moment of complacence that he is recognised by Nicolette who may seek out the magi to recover her memories and avenge herself upon her former master, drawing attention to his quest of transformation.